Built with the same dedication to quality as our pre-engineered and custom-engineered bridge cranes, Uesco Cranes also manufactures gantry cranes in a variety of configurations to meet the needs of manufacturing and industrial environments. 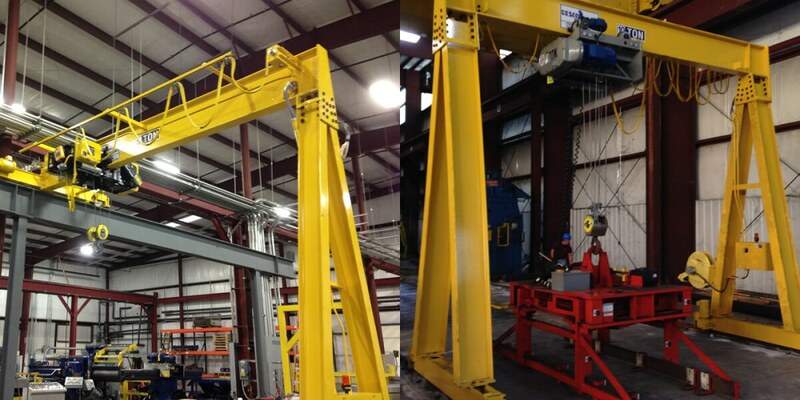 Using the structural steel beams used to build our other crane types and runways, our gantry cranes are built to last and to continue to perform to meet or exceed your expectations. With or without electrification and outfitted with hoists from the world’s finest brands, we can manufacture gantries to fit your unique requirements. We offer both trackless gantries and those which ride along tracks. Our gantries can span up to 40′ and can accommodate up to 15 tons in terms of capacity. Single-Leg Gantries are often used when space is an issue. One side of the crane has a leg which rolls on wheels (either on a track or independently) while the other utilizes either a top-running or under-running end truck mounted to an I-beam. Most of these cranes feature dual motors — one to drive the wheels along the floor, and the other to power the overhead end truck. Double-Leg Gantries are easy to install and relocate. They can ride along tracks or be trackless. These cranes offer a wide range of possibilities in terms of capacity, and they can be outfitted with virtually any kind and brand of hoist available. Furthermore, they can be manually operated or can operate via a power drive.